While in Las Vegas last year, I was shopping at the toy store for my son and the sales clerk asked me where I was from. I responded with “Saskatchewan” and he immediately asked if I was a farmer. I get asked that question a lot when I first meet people…that is, when they actually know where Saskatchewan is! Yes, Saskatchewan is known for its farming community but no, I’ve never lived on a farm. Did you know that more & more young Canadians are taking part in egg farming? In fact, many are taking over their family farms – some even in their 10th generation! My dad considered purchasing his parent’s farm when they sold it almost 20 years ago but he was already running his own business in the city. It’s great to hear that so many young people are getting into farming and taking over the family business. As a child, I spent many weekends at my grandparent’s farm. One thing I’ll always remember is Grandma’s cooking. Everything tasted better when it was fresh from the farm! One of my grandpa’s favourite treats were cream puffs and I have his recipe in an old family cookbook. I decided to make a delicious twist on a classic by adding in one of my favourite things – chocolate! There are a few steps to these cream puffs but they are well worth the effort! A sweet treat perfect for parties! For Chocolate Cream Puffs: On your stove top, boil water in a medium pot. Add butter to boiling water. Heat to boiling. Add salt. Add flour & cocoa, all at once, stir over the heat until smooth then immediately remove from heat. Cool mixture slightly in the pot (about 5 minutes) then add eggs one at a time. Between each egg addition, stir until egg is fully mixed in. It’s very important to only add one egg at a time during this process. Stir until mixture is no longer glossy. Drop walnut sized amounts (for medium sized cream puffs) onto cookie sheet (ungreased). Bake at 400 F for 25 minutes. Do not open the oven door while cooking...I know it’s tempting! Cool cream puffs completely before filling. For the Caramel Sauce: In a small pot, stir the brown sugar, cream and butter over medium heat. Whisk until the mixture comes to a boil. Add the vanilla and continue letting the mixture boil for about 5 minutes. Stir often to prevent burning. Remove from heat and let cool to room temperature before adding to buttercream. For the Caramel Buttercream: In a large bowl, beat (low speed) water, shortening and vanilla until well blended. Add confectioners’ sugar and beat (medium speed) for 3 minutes. Add in caramel sauce and beat just until blended. 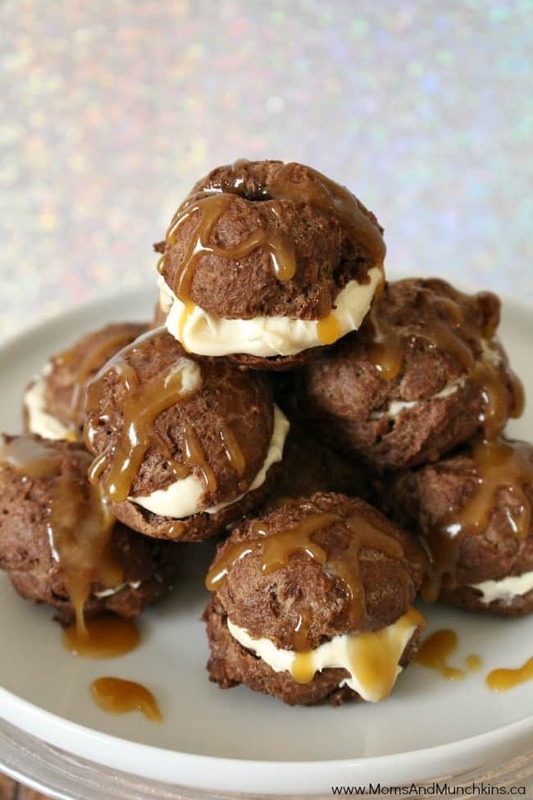 Fill each cream puff with approximately 1 tablespoon of caramel buttercream. Top with additional caramel sauce if desired. I’m thrilled to be a Brand Ambassador again this year with the Egg Farmers of Canada. They operate more than 1000 egg farms and family farms across Canada. You can meet some of these egg farmers by visiting the On The Farm section of eggs.ca. Be sure to check out the “Farmers’ Favourite” section for some of their best recipes! Hi Mallory! Yes, this guy happened to have family in the Saskatoon area. Small world, right? These are gorgeous, love your recipe! Oh my goodness! I have to try these cream puffs! These look great. I love chocolate though. Can you substitute a chocolate sauce? Hi Mary! Absolutely, substitute with whatever you’d like! Chocolate sauce would be a delicious alternative. This recipe is absolutely fantastic!! 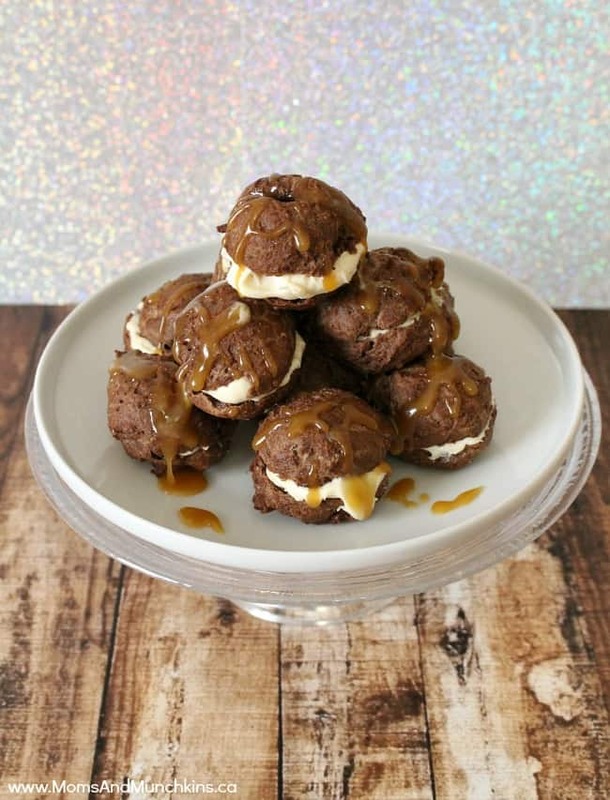 Easy to make and taste decadent!! I’m so glad you enjoyed it, Louise! Thank you for your wonderful feedback. Thanks, Mary! I hope you enjoy them!